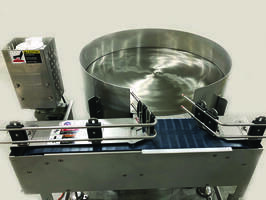 Winneconne, WI - Multi-Conveyor (www.multi-conveyor.com)- The Helix Upender, also known as a "twist" style conveyor, is typically used to change product orientation by either 90 or 180 degrees, either clockwise or counter-clockwise, to facilitate ink-jet printing, labeling, case packing or even hand pack operations. Constructed with two (2) Table Top chains set at 90 degrees to each other, products enter the system supported on the bottom chain. 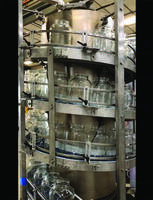 As they are transported, the two (2) chains are simultaneously twisted causing the product to rotate. 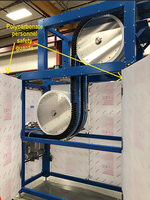 Helix upenders are also used for hand pack operations to rotate the product going into a secondary package, or to rotate the case so the product can be more easily inserted inside the case. These units readily accept multiple size products without the need for changeover. An Arm style Upender is an angled "arm" that is mounted alongside the main transport conveyor. The product is guided to the side of the conveyor which engages the Upender Arm, moving the product up the arm, thus changing its orientation by 90 degrees. 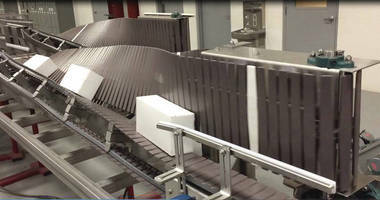 Matching speeds of the Arm Upender style conveyors are critical for smooth product transitions. 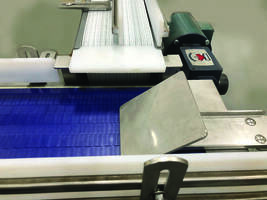 The main transport conveyor must maintain product speeds as they enter the Arm for proper product manipulation. In some cases, the customer requires the arm easily be disengaged to allow products to proceed down the line without orientation when necessary. Upenders come in a variety of chain widths. Products can range from cartons, cases, pouches, bags, wrapped trays, bundles, cans, bottles and more. A similar solution may be our Product Inverter, shown in the video, for 180 degree orientation. 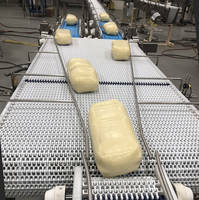 Basically, Multi-Conveyor can move and direct products at just about any angle, designing the conveyor configuration that best suits our customers packaging application. 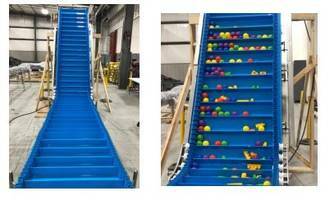 See more orientation solutions by visiting www.multi-conveyor.com. Multi-Conveyor, your best.... conveyed better. Upending Machine facilitates aligning of truck bed liner.